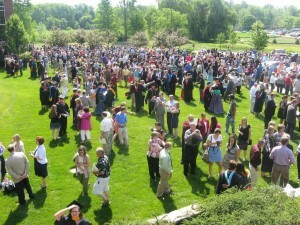 Graduates, parents, professors, and friends flooded the lawn of the Orthopaedic Capital Center for picture-taking and one last good-bye following commencement exercises this Saturday morning at Grace College & Seminary, Winona Lake, Indiana. Grace College and Seminary, Winona Lake, Indiana, this Saturday morning granted undergraduate and graduate degrees to 570 students during Commencement services held in the Orthopaedic Capital Center on the Grace campus.In a day marked by “lasts” and “firsts,” Provost Bill Katip and President Ron Manahan noted that this total included some of the last associate and bachelor’s degrees to be granted to prisoners, because of the cutback in state funding. At the same time, the 2012 class included the first graduates of the new Master of Business Administration and the new Master of Science degree in orthopaedic regulatory and clinical affairs. 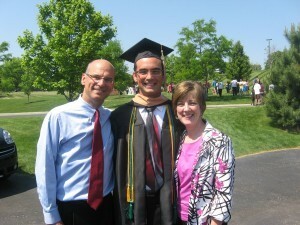 Dan and Holly Allan pause with their son, Jonathan, who was awarded a Bachelor of Arts in Business Administration and Marketing. Dan Allan is pastor of the Grace Brethren Church of Ashland, Ohio. In addition to undergraduate degrees, the college granted some 80 master’s degrees. Grace Theological Seminary granted 15 master’s degrees, four Doctor of Ministry degrees, and 21 Doctor of Missiology degrees. 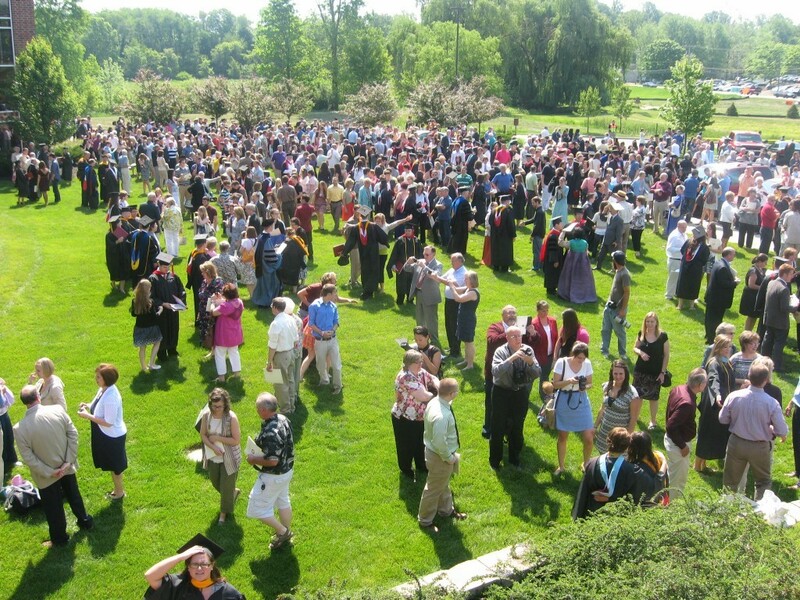 During the service, students were addressed by Grace College student body president Jonathan Haag, by Brent Mencarelli who represented the graduate student body, and music was provided by Rebekah Noack of the college class of 2013. Also present were several rows of “Golden Grads,” who graduated from either the college or seminary 50 years ago this spring. Grace Brethren pastors participating in the service included Jesus Munoz of World Encompass Partners, whose son and daughter-in-law were graduating, and also pastor Dan Allan of the Grace Brethren Church in Ashland, Ohio, whose son was a graduate. 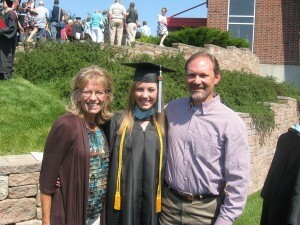 David and Julie Lawson pose with their daughter, Stephanie, who was awarded a Bachelor of Science degree in Elementary Education. David Lawson is administrative pastor at the Grace Brethren Church of Wooster, Ohio.